The U.S. Bombing Campaign: Is It War Or Counterterrorism? : Parallels President Obama has been reluctant to call it a war, yet the administration and the Pentagon boast of a 40-nation coalition and warn of a military operation that could last for years. 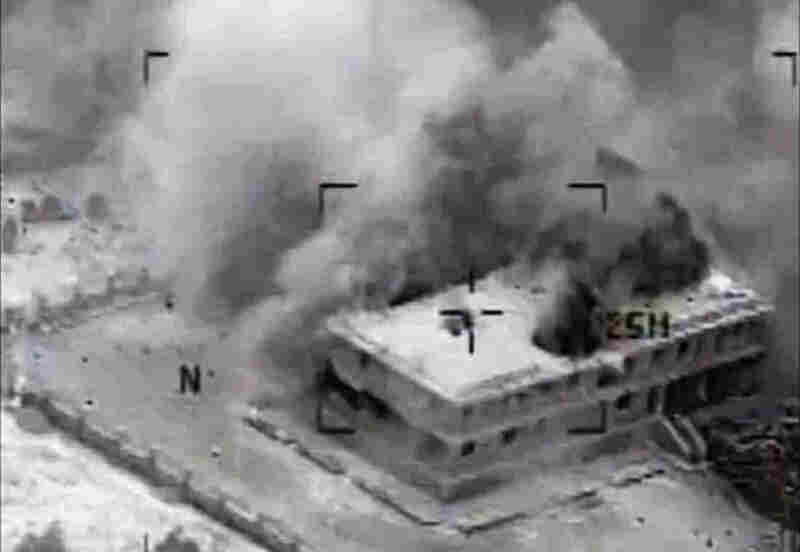 This still image was made from video released by the U.S. military on Tuesday that shows a building hit by a U.S. airstrike in Tall Al Qitar, Syria. The U.S. is describing the bombing campaign in Syria and Iraq as a counterterrorism operation and not a war. President Obama says the goal is to roundly defeat the Islamic State in Iraq and Syria because the threat is too serious to ignore. But he'd prefer you not call it a war. In a letter to Congress on Tuesday, the president said, "I have ordered implementation of a new comprehensive and sustained counterterrorism strategy to degrade, and ultimately defeat, ISIL," as the extremist group is also known. In this letter, and in keeping with recent speeches, the president makes no mention of war other than saying he is keeping Congress informed in line with the War Powers Act. Obama has spent much of his presidency winding down the U.S. wars in Iraq and Afghanistan and is reluctant to say that he's launching a new one. Yet the administration and the Pentagon boast of assembling a 40-nation coalition that unleashed more than 200 airstrikes in Syria on a single night with state-of-the-art U.S. fighter planes and help from five allied Arab monarchies. It's not just the administration that's hesitant to define this as a war. In a rare display of bipartisanship, many Democrats and Republicans are showing a strong preference for tending to local matters in their home districts rather than formally weighing in on the conflict in the Middle East. With the airstrikes in Syria, the U.S. has now bombed seven Muslim countries since the Sept. 11 attacks and the lines between a full-fledged war and counterterrorism have been blurred. The current effort contains elements of both as a broad, open-ended military campaign that also targets a specific terrorist group. One of Obama's initiatives has been to establish rules and a legal framework for conducting U.S. counterterrorism operations. Yet as The Washington Post notes, the president is now stretching the boundaries of the constraints he has been setting for himself. "Obama's decision to approve a Syria campaign required White House lawyers to scour international and domestic law and the administration's own counterterrorism guidelines for ways to justify operations that might exceed the narrow limits Obama had set on lethal action outside U.S. war zones," the Post writes. Clay Hanna, a former soldier who served in Iraq, argues in Politico that the Obama administration and the Pentagon are playing down how deeply involved the U.S. has become in Iraq. "Today, many of the advisers, logistics managers and other troops we already have in Iraq — said to be some 1,700 strong, including those guarding U.S. facilities — are already taking part in this new war," Hanna writes. "This strategy to send in 'advisers' to fight the Islamic State is subterfuge, and reflects conflicted leadership." 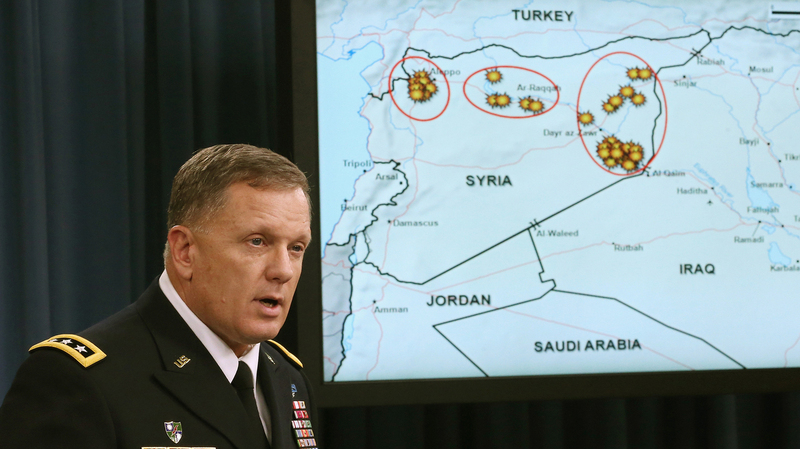 Lt. Gen. William C. Mayville Jr. speaks about the Syrian bombing campaign on Tuesday in Washington. Part of the administration's argument has been that it's not sending ground troops into either country and that the fight is against an extremist Islamist faction, not the government of Iraq, which the U.S. supports, or the government of Syria, which it doesn't. -- In an interview in the Jan. 27 issue of The New Yorker, Obama was asked about a resurgence of terrorist groups. "The analogy we use around here sometimes, and I think is accurate, is if a [junior varsity] team puts on Lakers uniforms, that doesn't make them Kobe Bryant," the president said. The context of that statement has been disputed recently. Obama said he wasn't referring specifically to the self-described Islamic State, though the group was being discussed in that part of the conversation. More broadly, the president's remarks at the time reflected the sense that the country was extricating itself from major military action in the Middle East. 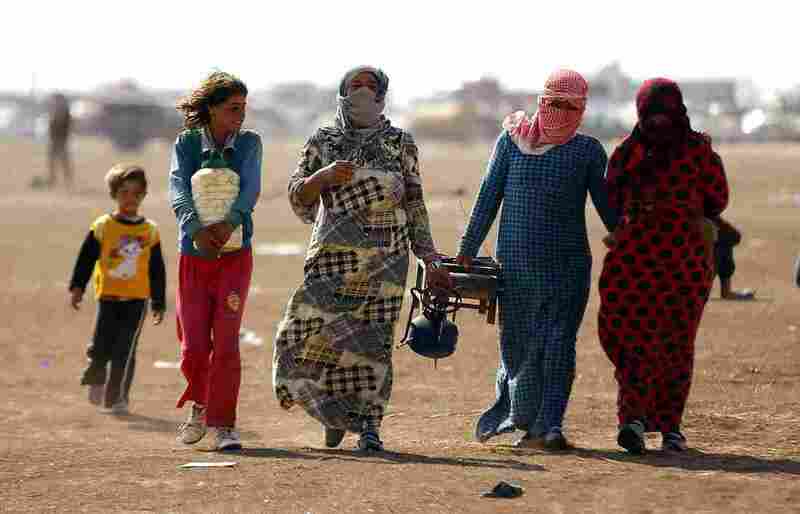 Syrian refugees who have left their homeland walk near the Turkish border town of Sanliurfa on Wednesday. The Islamic State assault against dozens of Kurdish villages in northern Syria has led to a mass exodus in recent days. "As frustrating as it is, there are no easy answers there, no military solution that can eliminate the terrible suffering anytime soon. As president, I made a decision that we should not put American troops into the middle of this increasingly sectarian civil war, and I believe that is the right decision. But that does not mean we shouldn't help the Syrian people stand up against a dictator who bombs and starves his own people. And in helping those who fight for the right of all Syrians to choose their own future, we are also pushing back against the growing number of extremists who find safe haven in the chaos." The next month, in June, the Islamic State notched its most spectacular victory by overrunning Mosul in northern Iraq, the country's second-largest city. While this set off alarm bells, the president dismissed the notion that the U.S. should have intervened earlier and in a larger way in Syria. In an August interview with The New York Times, the president said the idea of arming the Syrian rebels in the early stages of the war has "always been a fantasy." "This idea that we could provide some light arms or even more sophisticated arms to what was essentially an opposition made up of former doctors, farmers, pharmacists and so forth, and that they were going to be able to battle not only a well-armed state but also a well-armed state backed by Russia, backed by Iran, a battle-hardened Hezbollah, that was never in the cards." -- The president announced his intention to bomb the Islamic State in Iraq on Aug. 7, and the first strikes were launched the next day. The administration began describing the Islamic State in much more threatening terms than it had used before. The extremist organization "is beyond anything that we've seen. So we must prepare for everything," Defense Secretary Chuck Hagel said Aug. 21. "They're beyond just a terrorist group. They marry ideology, a sophistication of strategic and tactical military prowess. They are tremendously well-funded." In recent days, Obama and administration officials have been speaking of an imminent threat that includes not only the Islamic State but also the Khorasan Group, an al-Qaida offshoot rarely mentioned in the past. "We will support Iraqis and Syrians fighting to reclaim their communities. We will use our military might in a campaign of airstrikes to roll back ISIL. We will train and equip forces fighting against these terrorists on the ground. We will work to cut off their financing, and to stop the flow of fighters into and out of the region. Already, over 40 nations have offered to join this coalition. Today, I ask the world to join in this effort."